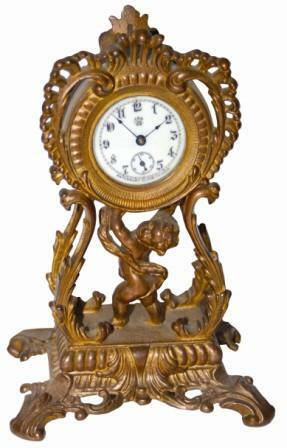 Waterbury Clock Co. novelty clock, "Alma". Case is 8.25" high, retaining the original patina, but is worn and a little dirty. It has an excellent signed porcelain dial, three good hands, and beveled glass in the sash. Back wind, patent date on the back, the movement is running.